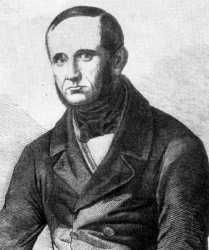 The first fully-fledged attempt to popularise Shakespeare among the general Polish reading public came from the Reverend Ignacy Holowiński (penname Kefaliński), who translated ten of his plays in 1839-1841. The value of his efforts was almost negligible. The general reception is best summed up by Slowacki who wrote: "It is a regrettable fact that in this translation Shakespeare has disappeared completely" (qtd. Ostrowski, 1964: 132). 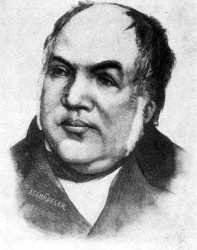 Nevertheless, Holowiński must be remembered for the great aim that he had, and for the zeal with which he inspired others more successful than he. The Polish public had to wait another thirty years to get access to Shakespeare's works in Polish. The era of true capable translators had at last set in. Józef Paszkowski (1817-1861), Stanisław Koźmian (1811-1885), and Leon Ulrich (1811-1885) were the greatest translators of Shakespeare into Polish in the second half of the nineteenth century. They remain pre-eminent among Polish Shakespeare translators to this day. Though many new translations have appeared since their publication of Shakespeare's works, the actors and the public often prefer Paszkowski's, Ulrich's, and Koźmian's versions. Their linguistic, stylistic, and poetic norms lie at the heart of the Polish response to Shakespeare. The lives of these three translators were, in fact, typical of thousands of Poles in the nineteenth and twentieth centuries. After a bloody suppression of the November Uprising in 1830-1831, many people were deported to Siberia. A lucky few escaped abroad. Ulrich and Koźmian were among the lucky ones; they managed to go into exile, making a prolonged stay in England. It was there that their lifelong devotion to Shakespeare originated. They became absorbed in deep and extensive studies of Shakespeare and his epoch, with the ambitious resolve of filling this unfortunate gap in Polish literature. While abroad, the translators were also actively engaged in the emigration societies. Koźmian, for example, was also Lord Duddley Courtts Stuart's private secretary, who, as the vice-chair of the Literary Society of the Friends of the Friends of Poland, organised parliamentary debates and action devoted to the Polish question, initiated general information in the press, convened meetings, and arranged financial support to the Polish Emigre in Britains (Golebiowska, 1999: 87-88). 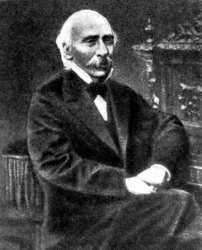 Józef Paszkowski, who had lived in Warsaw, had lost his state teaching position after the November Uprising. Seeking refuge from the gruesome political reality, Paszkowski turned to Shakespeare. Living on the border of poverty, he devoted the rest of his brief life entirely to translations of his most admired poet. In his invaluable study devoted to Paszkowski's translations, Tomasz Kubikowski maintains that the translator left Warsaw only once, and it is doubtful that he ever spoke with any Englishman in his life (1991: 18-19). Four plays in Koźmian's translation, thirteen in Paszkowski's and twenty in Ulrich's formed this new edition of Shakespeare's Collected Works. The cover page of the first full edition of Shakespeare's plays (1875). The Kraszewski Edition was a remarkable success. It went through three additional printings (1894, 1895, and 1896). Its success is not surprising, since many parts of the translations indeed display a genuine and unique beauty. Here and there the terseness and precision of the original have been preserved without marring in any way Shakespeare's poetic splendour. Quite often too, the translators manage to catch the tone of the dialogue admirably, conveying it faithfully by using archaisms. On the whole they preserve Shakespeare's jests, and render even the bawdy with admirable skill (Helsztyński, 1964: 242-248). Yet comparative analysis of the texts, original and Polish, shows that the translations are not of an even quality. And Paszkowski, Koźmian and Ulrich knew very well their own limitations. But though they never regarded themselves as model translators, their translations of Shakespeare's works have been regarded as models by the generations that followed. These translations penetrated the Polish language; Shakespeare's phrases and metaphors became an inseparable part of the Polish cultural heritage. Even nowadays Polish theatres prefer these slightly outdated versions of Shakespeare's plays, mainly because quotations from these interpretations have become fully integrated into Polish speech and any different approach to his works evokes controversial reactions and feelings. One instance of an offshoot from Shakespeare in Polish literature that is traceable to the great translators is in a nine-volume roman fleuve by Henryk Sienkiewicz (1846-1916), the Polish Nobel Prize Winner in Literature (1905). One of its characters, Zagłoba, the braggart soldier and misleader of youth, is obviously and directly modelled on Falstaff. 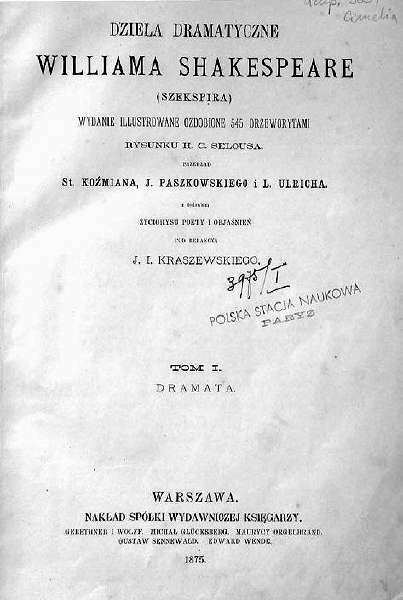 The Kraszewski edition not only firmly established Shakespeare within Polish culture, but it also facilitated the works of future generations. This edition supplied Polish readers with copious annotations, fruits of the translators' meticulous research. Out of the wide pleiade of Polish translators who tried their hand in interpreting Shakespeare to the Polish audience, Jan Kasprowicz (1860-1926), a famous Polish poet from the beginning of the twentieth century, was probably most interesting. Besides the fact that his translations were of high value, he was one of the first Poles who earned money through Shakespeare. Kasprowicz was approached with a proposal to translate Shakespeare's works at the time when he was settling in Poronin, in the Tatra mountains near Zakopane, where he had bought a plot of land and his cottage "Harenda." The house and its furnishing, which became an icon in Polish literary culture, were financed by the payment he received from the publisher for his translations of Shakespeare's works. Kasprowicz used to say that his "Harenda" in Poronin had been bought for him by a certain Englishman [Shakespeare] with whom he had struck up an intimate friendship (Kasprowiczowa, 1932: 111). The interpretative prohibition of Shakespeare's plays in the theatre under the Communist regime made people study Shakespeare in private. They converted their creative powers into many new translations, which appeared in print after death of Stalin (1953). In the years between 1950-1964, over thirty volumes of Shakespeare translations were printed. Each volume usually contained one or two plays, newly translated; never before had there been in Poland so many people engaged in the work of translating Shakespeare. The majority of this new group of the Polish translators were practising poets. They drew on their own creative experience while seeking to preserve the essential quality of the original. The Polish translations of that time reveal a wealth of inventive spirit and poetic gift. On the assumption that the opportunity for comparison between various renderings led to the just appreciation of Shakespeare's plays, publishers often brought out versions of the same play by a variety of authors. It is indeed amazing that even at the most difficult times for the Polish economy, Shakespeare's translations still found their way into the hands of Polish readers. Further, in view of the large new reading and theatre-going public, re-editions of old translations--Paszkowski's, Koźmian's, and Ulrich's--were also issued by the presses. Some of the best new versions have been rendered by women. Zofia Siwińska, who began her work in the fifties, and Krystyna Berwińska a decade later, are both philologists, whose knowledge of theatre is deep and thorough. They follow Shakespeare's text and metric system strictly, and their translations are as precise and clear as the original (Kujawińska Courtney 1996: 24). However, Jerzy Sito is probably the most controversial translator of Shakespeare in contemporary Poland. This poet shows a greater freedom than any other translator does in his handling of the original text. Attractive as his interpretations are, they may, without disparagement to the author, be called paraphrases rather than translations. Accustomed to Shakespeare quotations well established in the Polish language by the more traditional versions, the theatre audience receives Sito's work rather reluctantly. Only three translators of Shakespeare in Poland have taken on the enormous task of rendering into Polish the totality of the Shakespeare canon. One was Leon Ulrich, another Władysław Tarnawski, whose work was published after Stalin's death. Sentenced for his clandestine activities against the Communist regime, Tarnawski translated Shakespeare's work in prison, where he prematurely died in 1951. (See also: Starnawski: 1994: 289-291.) The third is Maciej Słomczyński, a very talented translator, though his style of life and his work were the subject of continuous literary controversies. [Note 42] Many passages of his translations strike the reader as novel and fresh; they are rendered in perfectly natural Polish and they still reflect a faithful translation of the original. He was praised by Jan Kott, who maintained that Slomczynski gave Polish readers "the first great and authentic Shakespeare." In an introduction to his translation of Hamlet, Stanislaw Helsztynski, one of the most eminent Polish Shakespeare scholars, wrote that "luckily Polish August Schlegel, a congenial translator of the great Stratford poet, was born, giving us [. . .] this time the most Elizabethan Prince of Denmark" (Slomczynska-Pierzchalska, 2003: 277). Gdy głos sowy będzie brzmiał. Whatever the new generations of critics and the actors say, Słomczynski's translations have indeed given the Polish public a philologically correct, updated Shakespeare. Recently, Stanisław Barańczak has translated some of Shakespeare's works. They are usually praised by the actors but criticised by Shakespeare scholars. Anna Cetera classifies his translations as a theatre-oriented rewriting, marked by a deliberate intervention in reinterpreting the texts (1999: 116-127). Barańczak's works demonstrate an unusual sense of dramaturgical space and movement, but they are often far from the original text. In addition, the translator adjusts the texts to modern modes of stagings often enough for the price of dispensing with time-bound rhetoric and obscure references to Elizabethan reality. He also purges the text of stylistic features, which could undermine the emotional authenticity of stage elocution. The policy results in the creation of a text of remarkable coherence and clarity, but marked by strong interpretative bias.